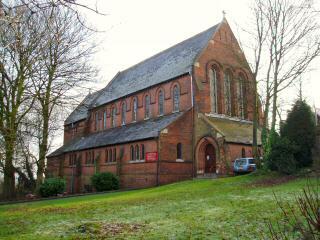 The neat red brick church, built in the Early English style, opened in 1883 ready to serve the new parish of West Coseley formed in April 1884. With a spire mounted on the apex of the main roof it stood out on the hill side in marked contrast to the close by dilapidated tower mill. [A representation of the mill can be found in the memorial east window]. Unfortunately, the spire’s dominance only lasted until 1967 when it became unsafe and was removed. The single bell was re-hung on the south-west corner. In 1879 worship was taking place in a George Street mission room less than half a mile away in Swan village. Once again the Earl of Dudley, the Manor's major land owner, gave land and £1,000 towards erecting a new church. However, the parish of St. Mary Abbots in Kensington was also a key benefactor funding curates and some of the building work. [This London church was built in 1872 and has the tallest spire in the capital]. The main building, with seats for 500, cost about £3,700 leaving the organ chamber and choir vestry to be added later for another £200. A vicarage completed the layout in 1896. In June 1946 the memorial east window was dedicated to those who gave their lives in the Second World War. The bronze memorial tablet records twenty two names. To the west the church now overlooks extensive housing, but at the end of the C19th there was a massive open cast mine belonging to Claycroft Colliery. A photograph from that period shows the church and mill seemingly on top of a cliff. Incidentally, the son of the Rev. James E. Walker [Vicar from 1898 to 1912], died in the Great War and is buried in the cemetery of All Saints, Sedgley. The grave is marked with a Commonwealth War Grave headstone. The support St. Chad's received from St. Mary Abbots in the late 1870s and early 1880s can be explored in more detail here (opens in new window). 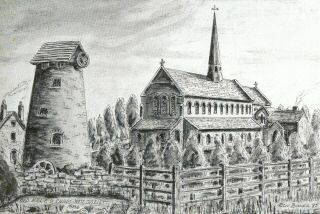 Ron Baker's fine sketch, based on a contemporary photograph, shows the church in its 1880s setting. The church and mill are clearly exposed in this winter's scene. They are about the length of a cricket pitch apart and nearly 600 feet above sea level. This view of the north side show the well proportioned architecture and detail achieved in the transition from Gornal stone to brick. Earlier Victorian parish churches in the Manor had always been faced in the locally quarried stone. The foundation stone was laid by the Bishop of Lichfield on St. Chad's Day, March 2nd 1882 and the church was consecrated one year later. 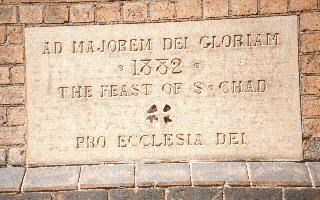 The Latin inscription means 'To the greater glory of God'. All the photographs were taken in January 2004.